Pez is a quarter-inch candy that fits nicely inside of a Pez dispenser, which collectors have been hunting for years. Pez was intended to be an adult candy, and was invented in 1927 by Eduard Haas III, an Austrian who was a pioneer in the antismoking cause. Haas' Pez prototypes were all mint, intended to curb cigarette cravings. The first Pez dispenser was invented by Oskar Uxa, who was a Pez employee. The first dispensers were shaped like a cigarette lighter. 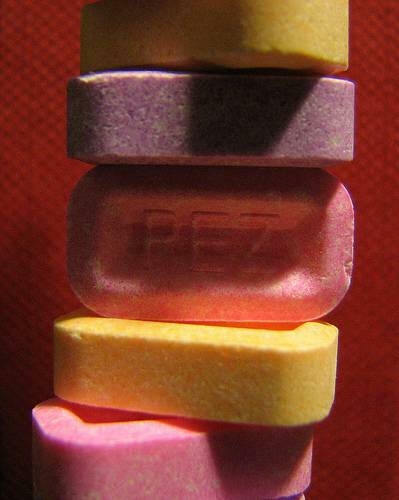 The word Pez is actually an anagram for the German word pfefferminz, or mints in English. Haas Food Manufacturing Corporation of Vienna, Austria, manufactured and sold Pez until 1952. It was during this time that U.S. patent 2,620,061 was issued to Haas and Uxa, and the Pez Corporation was born. Pez quickly swept the nation as a candy marketed toward children. The cigarette lighter dispenser was replaced by a dispenser resembling a character with a head. The first U.S. Pez dispensers were made to look like Santa Claus and Mickey Mouse.